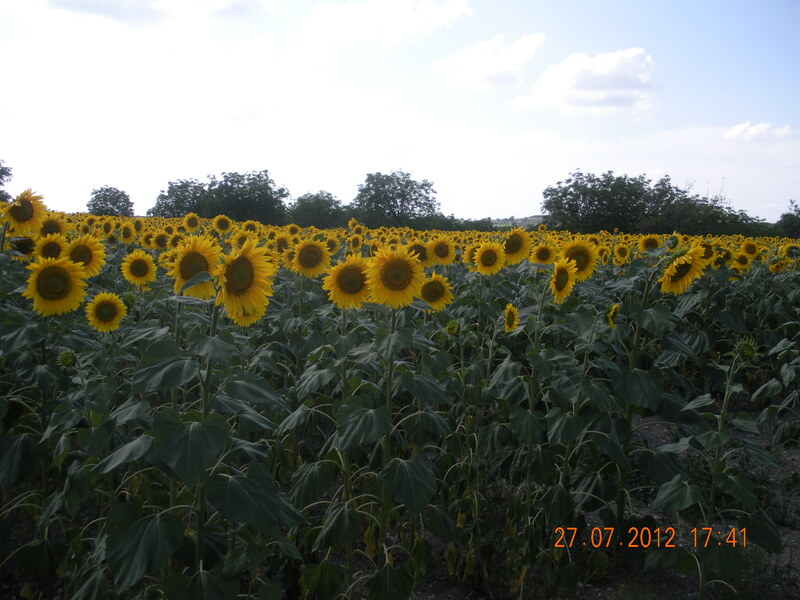 It is Sunflower time in France!! Huge fields of brilliant yellow faces! 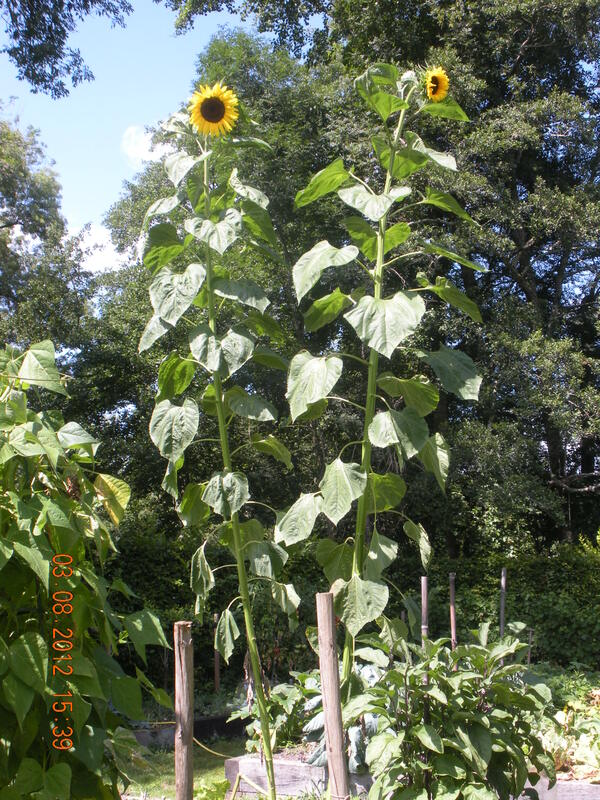 Sadly the Sunflowers no longer follow the journey of the sun across the sky – their French name Tournesol is no longer relevant ….. just another interference by man in genetic modification! In fact these brilliant flowers which give such joy to the heart appear to droop their heads prematurely – maybe in sadness? vegetable garden. However, I think my potent liquid chicken manure, with comfrey and nettle leaves added to the potion, has done more than needed – these plants are like giants! Simon told guests “My wife grows them for the vase”! I have never seen such thick stalks. just how high they will grow! 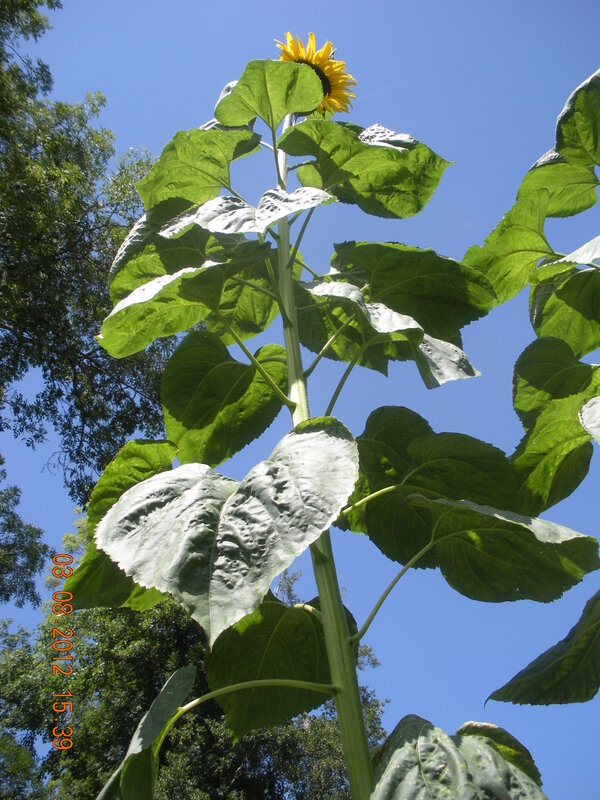 WELL-BEING MESSAGE : Cold pressed sunflower oil has remarkable healing qualities. It is also excellent to use as a mouth rinse once a month, to remove bacteria from the teeth and tongue. First thing in the morning before brushing your teeth, take one tablespoon of cold pressed sunflower oil and use it to rinse around your mouth for at least two minutes – do not swallow as it will be full of toxins, it becomes rather thick and yellow. Spit out and thoroughly rinse out your mouth with fresh water. For best results do on the morning of the New Moon. This entry was posted in Food & Wine, Healing, No children, Organic, Peace & tranquility, Spiritual retreat, Well-Being and tagged good feelings, happiness, health, plants, well-being. Bookmark the permalink. Are you serious? Put sunflower oil in my mouth? Well, I’ll try anything once. Will let you know how it goes.